It doesn’t entirely live up to its promise to take the guesswork out of smoking your food, but the results are delectable nonetheless. 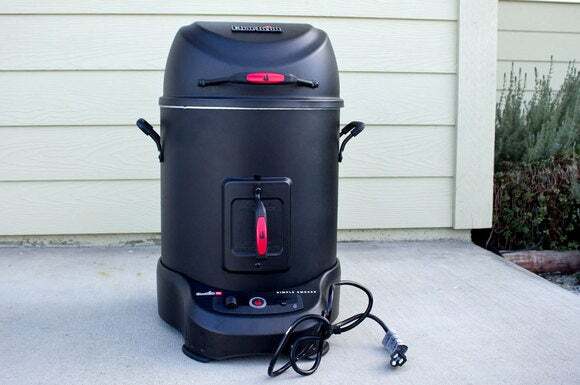 If you love smoked meat, but have been intimidated by the prospect of tending the coals in a barbecue pit for hours on end, you’ll want to check out Char-Broil’s Simple Smoker. This electric cooker has a meat probe and it communicates with your smartphone via your Wi-Fi network, so you get perfect results with zero fuss. But the Simple Smoker has one major weakness that Char-Broil should and could easily fix: The smartphone app that controls the smoking process is abysmal. Fortunately, the app’s shortcomings don’t prevent me from giving the smoker itself a buy recommendation. The core of the Simple Smoker’s appeal is its ability to almost automatically slow-cook food while imparting delicious smoke flavor from smoldering wood chips. If the app worked as advertised, you could start the multi-hour process and walk away, with the app issuing a reminder every 45 minutes to replenish the supply of chips and then informing you when the process is complete. In that respect, the app is as key to the smoker’s value as its meat probe, but its many shortcomings never resulted in a poorly cooked meal—because aside from the probe readings, I didn’t trust the app from the get-go. I don’t like starting a positive review by focusing on the negative—especially when my overall opinion is positive—but the reason I found the app suspect was that it had so few recipes. When you’re ready to start cooking, you click on Choose Food in the app. This brings up four categories of meat: Beef, chicken, pork, or turkey. There are no settings for vegetables; more importantly, there are no setting for any variety of fish. In fact, each of the four meat categories that are included has just two subcategories at most: Beef brisket or prime rib; a whole chicken or just the wings; baby back ribs or pulled pork; or a whole turkey. 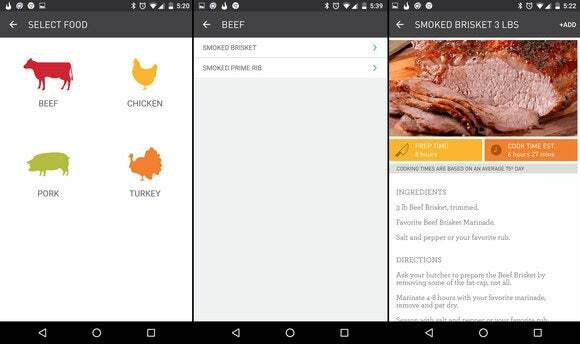 As you can see from these three screenshots, Char-Broil’s app looks like an afterthought, even though it’s integral to getting good results from the smoker. I decided beef would be the most foolproof food to start with, since eating a good cut of rare beef is less dangerous than consuming undercooked pork or poultry. I wasn’t about to experiment with something as expensive as a prime rib, so I decided to give brisket a try. But then I discovered that my local grocery store doesn’t stock brisket (I’d have to special order it, so the butcher suggested tri-tip as a substitute). I brought home a three-pound chunk, seasoned it with my favorite dry rub, and put it in the fridge overnight. You can hang shelves inside the roasting basket to smoke smaller cuts of meat. Char-Broil recommends wiping down the wire roaster basket and the removable cooking chamber it fits into with vegetable oil each time you cook to reduce the chances of the food sticking, which I did the next morning. I pulled the beef out of the refrigerator, inserted the six-inch temperature probe, placed the meat in the roaster basket, and put the basket inside the cooking chamber. I then selected the brisket recipe and indicated its weight: three pounds (my only other choices being two pounds or four pounds). The app has rudimentary recipes for the few cuts of meat it covers, including instructions for preparing the meat prior to cooking, and it suggested cooking the brisket to an internal temperature of 220 degrees Fahrenheit. The app reported that it would take six hours and 27 minutes to bring that much brisket to that internal temperature. You can use the app to stop the smoker—and the smoker will automatically turn off when your food reaches its target temperature—but you must physically push a button on the smoker to start it. That’s a smart safety precaution that forces you to ensure that no one—especially kids—are lingering near the smoker unaware that it’s about to heat up. I loaded the smoker box with a couple handfuls of mesquite chips, pressed the start button on the smoker, and then tapped the "add chips" button in the app. You can delay adding chips for as long as you want in order to minimize the smoke flavor, or you can use a different species of wood. 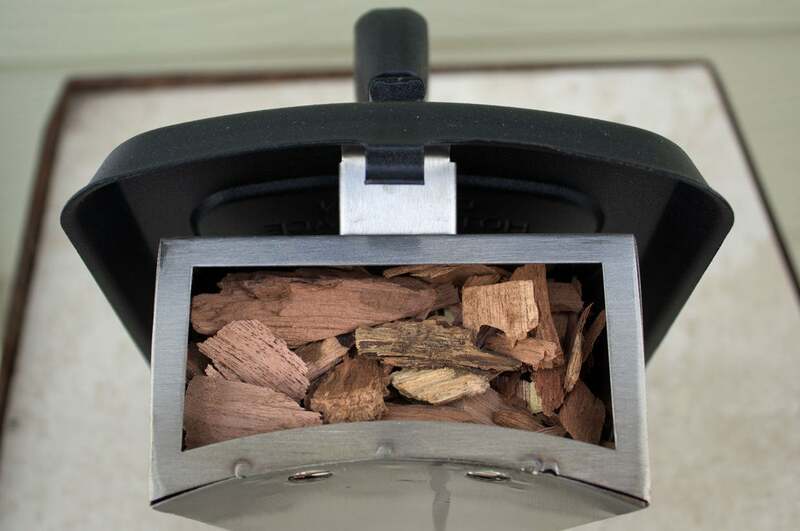 Char-Broil’s skimpy user manual suggests hickory, oak, pecan, or mesquite for heavier flavor; or alder, maple, cherry, or apple for lighter flavor. Another time-saver: You don’t need to soak the chips before using them; in fact, Char-Broil recommends that you don’t soak them as that will only delay their smoking. The smoker box fits into the front of the smoker, lining up with two holes in the inner cooking chamber so the smoke can reach the meat. Note that the box can accomodate only wood chips, not chunks. After 45 minutes, the app chimed to remind me to check on the status of the chips, about half of which had burned away. This sequence repeated every 45 minutes until the food was done. And it was done much sooner than I’d expected. Now I prefer my beef on the rare side, so I took advantage of the apps’s “edit” feature to change the probe’s target temperature from the 220 degrees suggested for brisket to 160 degrees for the tri-tip I was actually cooking. 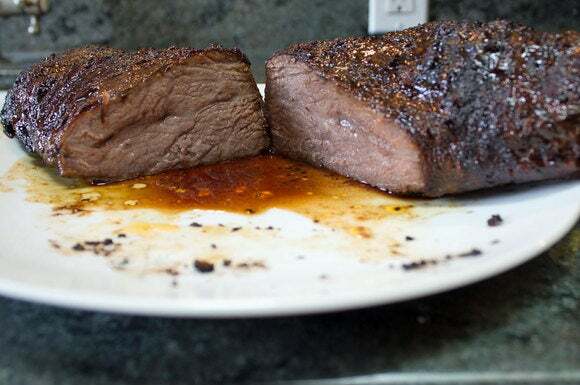 Since tri-tip is a denser cut of meat than brisket, I guessed that it would take close to the same 6.5 hours, but the beef reached my desired internal temperature in less than 3.5 hours—and by its appearance (inside and out), it was more cooked than I would have preferred. But after I’d let the meat rest on the counter under a foil tent for 15 minutes, sliced off a piece, and bit into it, I thought I’d died and gone to heaven. It was the most tender, juicy, delectable piece of tri-tip I’d ever eaten, with an amazingly flavorful crust all around the outside. Just remembering it makes my mouth water. After that experience, my wife and I decided to try turkey; but since the two of us can’t polish off an entire bird, we bought a package consisting of a partial breast and two legs. The app doesn’t take such portions into account, so we looked up the USDA-recommended internal temperature for turkey meat, stuck the probe into one of the legs, and used the pork-ribs setting. Although we had to monitor the temperature-probe readout carefully, the results were every bit as satisfying as they were for the beef. Over a period of several weeks (we used the smoker only on weekends), we prepared fresh wild salmon steaks, baby back ribs, chicken wings, pork loin chops, and another tri-tip. We got outstanding results each time, despite having to make some educated guesses about how and how long to cook things. The temperature probe—always placed in the thickest part of the meat—was critical to our efforts in each case. You can use the app to adjust the food’s internal target temperature and the smoker’s cooking temperature (from 125 to 525 degrees Fahrenheit), but you can’t program its cooking time and the app doesn’t recalculate cooking times when you change the other parameters. As a result, I found myself monitoring the app much more than I think should have been necessary. In addition to providing more recipes, it would be great if the app could be programmed to chime when interim temperatures are reached, so you’d know when it was time to start preparing side dishes. As it stands, it’s incumbent on you to keep an eye on the app so you’re not surprised when it chimes to inform you the meat is cooked. 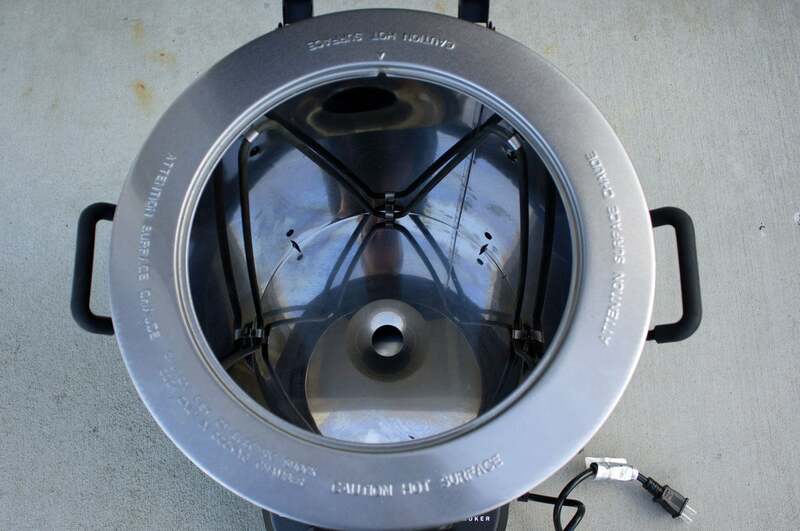 The Simple Smoker consists of a barrel-shaped enclosure that's about 27 inches high, including its domed, hinged lid. A stainless-steel cooking chamber 11-inches in diameter sits inside of this, and a roaster basket big enough to cook a 16-pound turkey fits inside that. 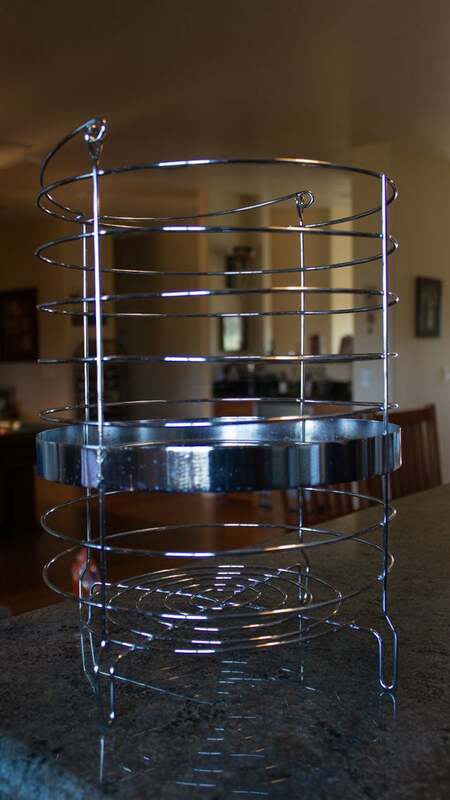 Two wire half-shelves can be hung inside the roaster basket (at staggered levels, if you choose) for smaller cuts of meat or whole chickens, and there’s a second roaster basket that can sit on top. The top one is particularly well suited to cooking vegetables, since it’s farther from the heating element. Char-Broil’s user manual issues a number of warnings about where the smoker should be located when in it’s use: Not under a roof, not under an eave, at least 24 inches from any wall or railing.... It also discourages you from using an extension cord, a recommendation you might find difficult to follow given the smoker’s short 5-foot power cord. Finding the ideal outdoor location for the smoker could compromise its ability to reach your Wi-Fi network, too. Using Wi-Fi is superior to relying on Bluetooth, because your phone doesn’t need to be near the smoker for the app to function. But both your phone and your smoker must be within range of your Wi-Fi network. My Wi-Fi access point is in the center of my home, and I have a lot of outdoor electrical outlets, so I was able to find a spot for the smoker on my back porch that was well within range of both my AP and an electrical outlet. This flimsy aluminum-foil grease tray is one of the more disappointing elements of the Simple Smoker’s design. On the bright side, the drawer it fits inside is made of stronger stuff. Even if you follow Char-Broil’s instructions and wipe the roaster basket and the walls of the removable cooking chamber with oil before each smoking session, the Simple Smoker can still be difficult to clean. A self-cleaning setting that super-heats the interior in an effort to turn the food residue into a crust that can be knocked loose with a stiff brush brush helps. On the one hand, the cleaning cycle is no more effective than what you get with the typical self-cleaning oven. On the other hand, I found the smoker easier to clean than my gas grill. 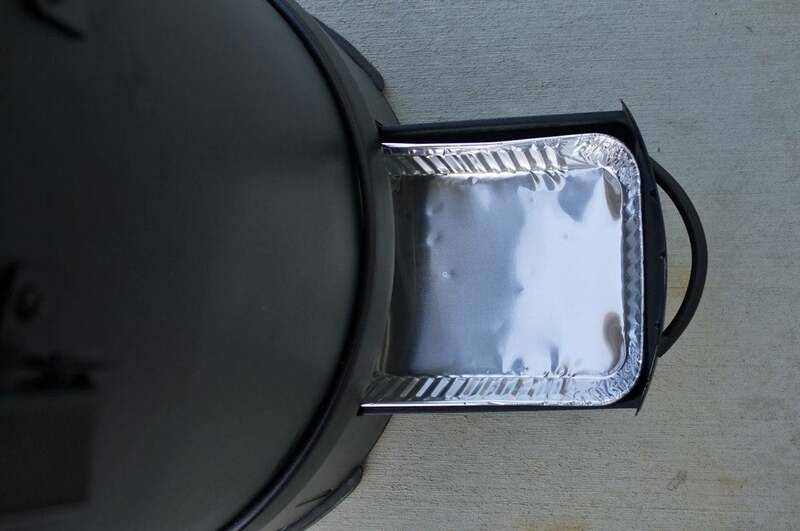 Char-Broil recommends covering the smoker if you plan to leave it outside, but it doesn’t offer a purpose-built cover even as an added-cost accessory. Given that it's an electric appliance, I wouldn’t advise leaving it out in the rain even it is covered. A pair of handles on either side make lifting the 31-pound appliance a little easier. Is it really worth 300 (smoked) clams? You can buy a relatively fancy grill for $300, but I’d warrant that the food you cook on it wouldn’t taste as good as what comes out of the Simple Smoker. I have a built-in, five-burner gas grill, and I honestly don’t know how much use I’d get out of it if I also had one of these on my patio—except that the barbecue is under a roof with a powerful fan overhead, so I can grill rain or shine. I would also guess that the smoker would last longer than a $300 grill if properly cared for, since none of its components are exposed to a flame and most of its internals are fabricated from stainless steel. If you like the taste of smoked meats, and you can tolerate Char-Broil’s crappy companion app, I recommend it. The Simple Smoker does a great job and would have earned an even higher score if its app wasn't so poorly executed.